The GoFog™ Humidification System uses the most dependable high pressure pumps on the market today. A Variable Frequency Drive (VFD) provides a soft start and maintains the 1,000 psi operating pressure as the system modulates output. This not only guarantees an efficient use of energy but also a quiet low maintenance operation. Communication Modbus, BACnet, LON, and others available. Please specify the required BMS protocol. * Additional pump rack sizes are available. Please ask your GoFog™ representative for further information. 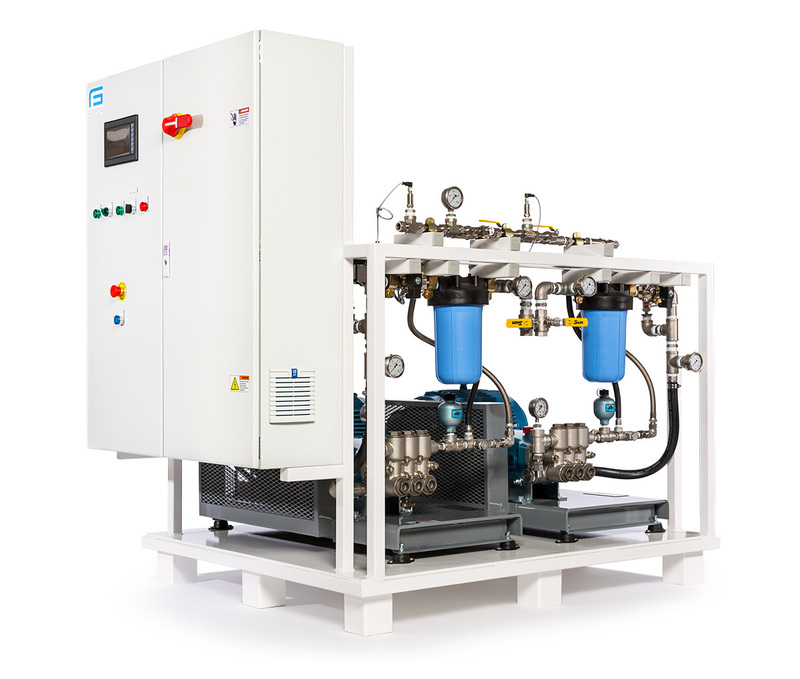 Humidification projects not only demand a reliable pumping system to supply 1,000 psi water to all the nozzle manifolds, but in critical applications they also require redundancy ensuring zero downtime. 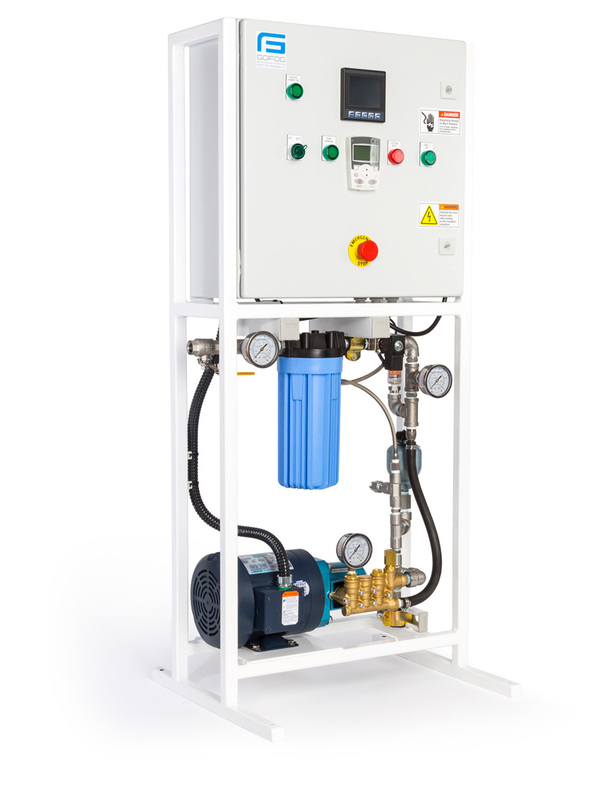 Choosing the correct pump system couldn’t be easier because all GoFog units can be selected with a pre-engineered option for redundancy. 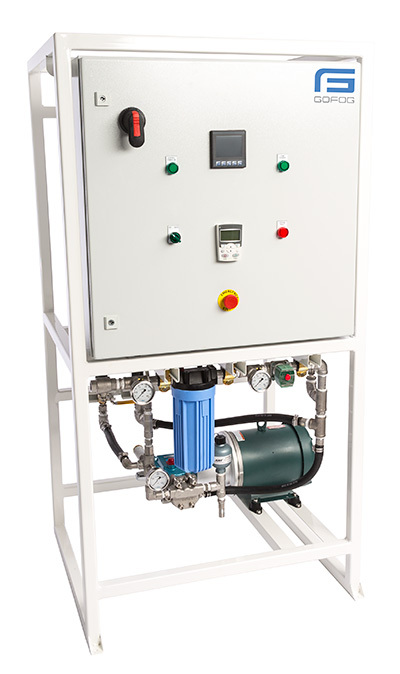 These units are pre-piped, pre-plumbed, factory tested, and use your desired BMS communication protocol. They operate as alternating duty/standby that automatically switches over to a standby pump and VFD if a fault condition occurs. All systems are designed for a maximum pump speed that is less than 70% of the manufacturer’s suggested rating, which provides a quiet operation and extends the required time between oil changes to every 2,500 hours. Smaller projects can be difficult because the humidity load is too low to justify the cost for a commercial humidifier and too high for a residential unit. The Pico Pump Rack bridges this gap without sacrificing quality. All units come with the normal bells and whistles you’ve come to expect (PLC, VFD, CAT Pump), but at a fraction of the size and cost.